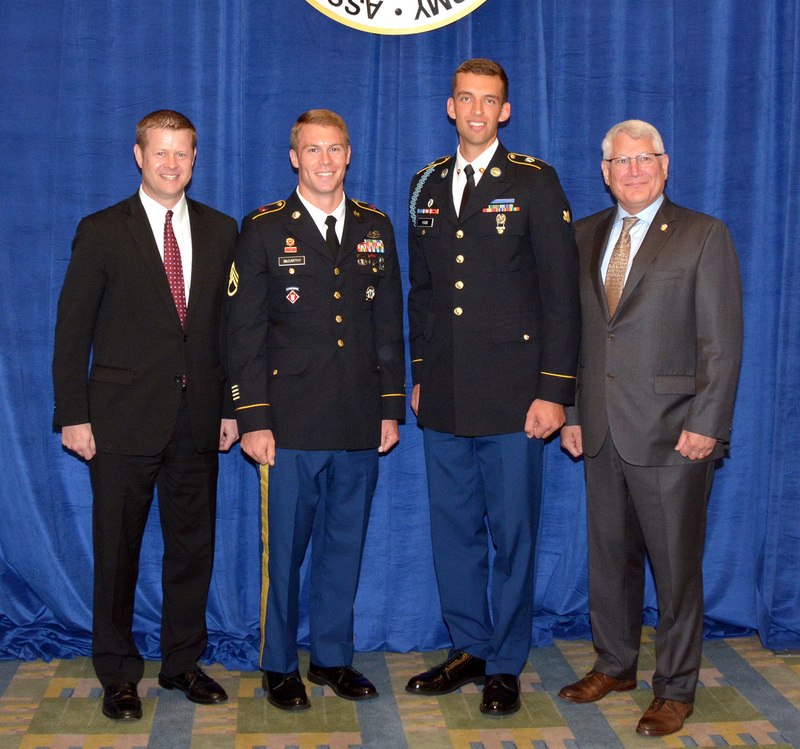 The winners of the U.S. Army Best Warrior Competition were announced during the Sergeant Major of the Army Awards Luncheon at the Association of the U.S. Army’s Annual Meeting and Exposition in Washington, D.C.
Spc. Hazen Ham, U.S. Army Pacific, is the Army’s Soldier of the Year, and Staff Sgt. Ryan McCarthy from U.S. Army Training and Doctrine Command is the Noncommissioned Officer (NCO) of the Year. During the six-day Best Warrior Competition at Fort A. P. Hill, Va., 22 of the Army’s finest representing 11 commands test their Army aptitude by conquering urban warfare simulations, board interviews, physical fitness tests, written exams, and Warrior tasks and battle drills relevant to today’s operating environment. 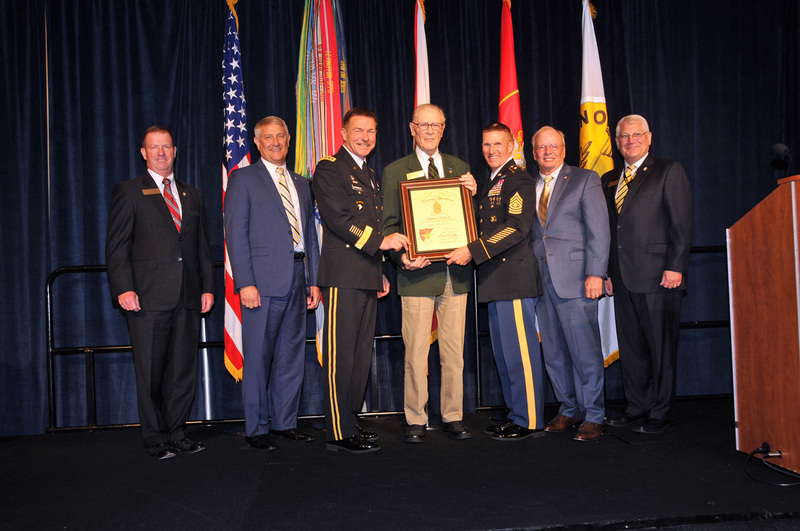 “We have the world’s greatest Army because we have the world’s greatest noncommissioned officers and soldiers,” said Army Vice Chief of Staff Gen. James McConville, the luncheon’s keynote speaker. “They are highly trained, extremely well-disciplined and they set the example in being physically fit. They are the best of the best,” he said. Ham has been in the Army for nearly two years, and serves as an infantryman with the 25th Infantry Division. McCarthy is a combat engineer with nine years of service, including deployments to Iraq and Afghanistan, and is currently stationed at Fort Leonard Wood, Mo. Before presenting the awards, McConville noted two examples of enlisted leaders who epitomize what an NCO should be: Command Sgt. Maj. Scott Schroeder and Command Sgt. Maj. Alonzo Smith. McConville asked Schroeder a question when they first met: Should an NCO teach soldiers what to think, or how to think? The answer Schroeder gave, McConville said, is to first teach what to think. “He [Schroeder] told me that we need to train them to move, shoot and communicate. We need to make them masters of their profession, and instill the Army values, before anything else,” McConville said. Smith is a combat veteran who was wounded by an 82 mm recoilless rifle in Kandahar, Afghanistan, causing him to lose part of his leg. After a difficult recovery, Smith became command sergeant major for the 101st Airborne Division. Also during the luncheon, Sgt. Maj. of the Army Daniel Dailey named retired Gen. Frederick Kroesen as the third Honorary Sergeant Major of the Army. “This award recognizes one thing – lifelong service to soldiers and their families,” Dailey said. Kroesen is a former Army vice chief of staff who has been in combat and received the Purple Heart three times – in World War II, Korea and Vietnam.